You may be wondering what a ferret is doing on a site called Vitamin Stuff. Then again, you may also have wondered how some of our leaders in Washington actually got elected. Sometimes, things don't seem to add up. However, in this case, they do. Chloe is just crazy about health and nutrition. 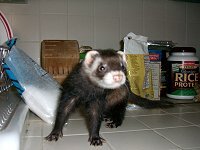 Here you'll find posts regarding ferrets and my ferret, Chloe (codename: Destructo), in particular. How will you know when a ferret is sleepy and should go to bed? How many ferrets are there named Chloe? How much play-time does a ferret need? Chloe is so adorable!! Why is it that the sweetest ones are also the most insane when it comes to getting into anything and everything? Insane is a characterization I could live with. I just posted about Chloe and her attempts to destroy my living room couch. Oh my gosh! Total cuteness!